I am so pleased with how my Christmas mantel turned out this year. I wanted the mantel to have a cozy, elegant-yet-approachable vibe to it and I think I managed to accomplish my goal! I used fresh greenery, mercury glass, white, and a touch of apple green in my color scheme. The most difficult aspect of putting the mantel together was finishing my wood round wall! I actually broke my saw guard trying to cut all of those little wood circles, so only two panels were able to be filled. I would like to fill the end panels with wood but that will have to wait until my saw is fixed. Don’t you think fresh flowers make everything look better? I wish I could afford to don every room with fresh flowers! Our grocery store always carries bundles of flowers at reasonable prices, so occasionally I like to treat myself. Alstroemeria, carnations, and mums are great picks because they last forever and look beautiful in like-color groupings. I have received a lot of questions regarding my angel wings. I scored these at Marshall’s and unfortunately I haven’t heard that anyone else has been able to find them in their stores :(. They were hanging in the middle section with the ornaments in my store and were priced at only $14.99. They are made of metal so it was a terrific price! I didn’t like the original color so painted and distressed them to my liking. 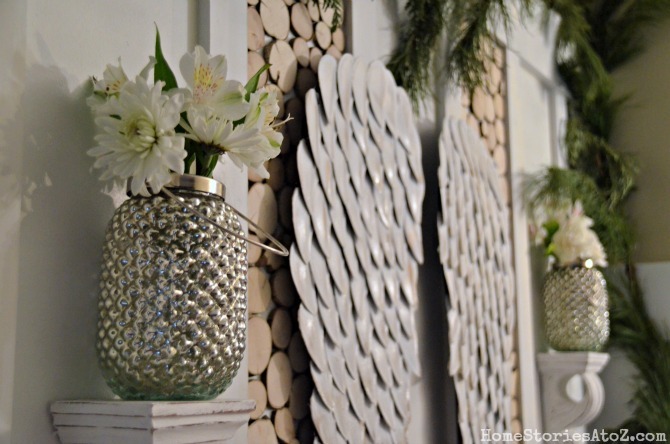 You can find the full tutorial on the link for my angel wings and Homemade Chalk Paint Recipe. The capiz shell garland is actually made from punched wax paper circles and string. I made the garland 3 Christmas’ ago, and it is still going strong! You can see the garland the first year I made it looking beautiful draped on my Ballard Designs Inspired tree. You can also click on the link to find the tutorial for my Pottery Barn inspired Birch Bark Candles that I made this year. 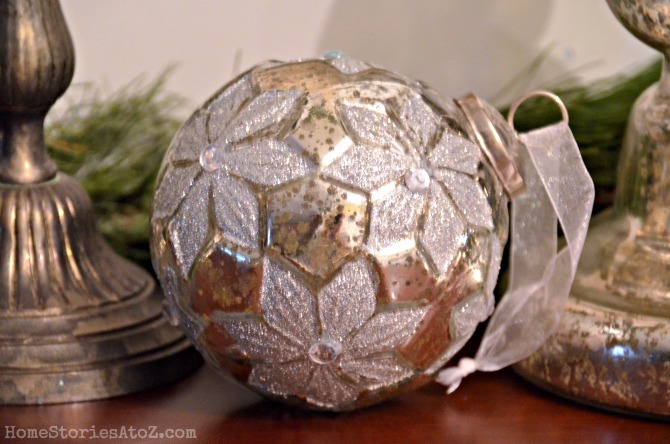 All of my mercury glass ornaments on the tree and on the mantel came from TJ Maxx and Marshall’s. I just haven’t found another source for mercury glass items that is cheaper! 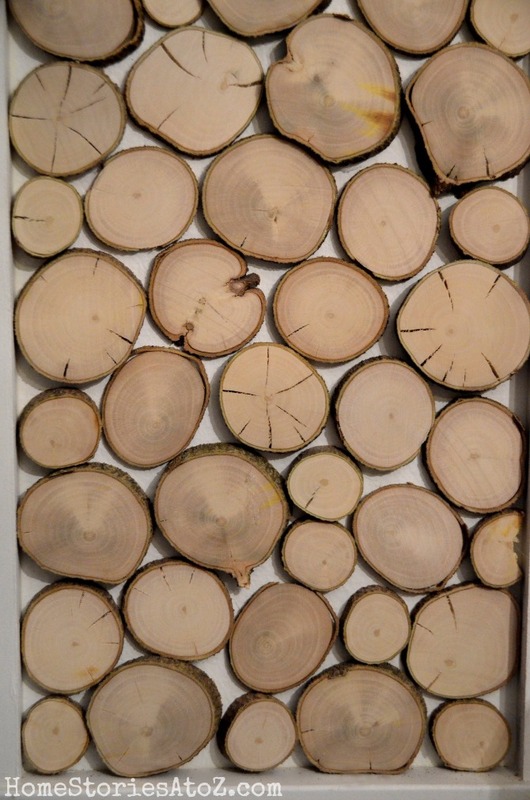 Below is a close-up of the wood round wall. 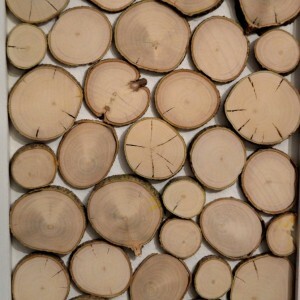 I sliced my logs as thinly as possible and just hot glued them to the wall! I took a few off to see if they will damage the wall and they came off without any damage. I’ll leave them up on the wall until I tire of them and pop them off when I feel like it. For now I adore the way it looks! And here is one more full beauty-shot for you! 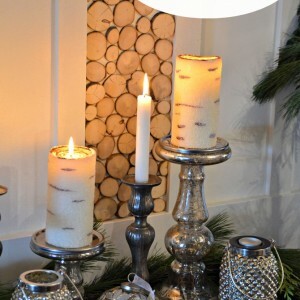 I am enjoying my mantel this year and I hope you do too! Thanks for stopping by to see :). 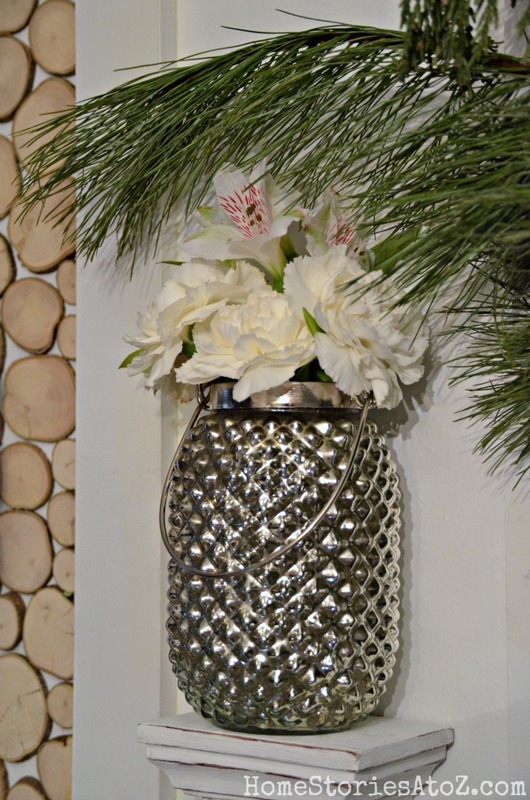 those mercury glass vases are so pretty! the tree cookies on the wall look great too! BRILLIANT!! I love your eye…inspiring.. 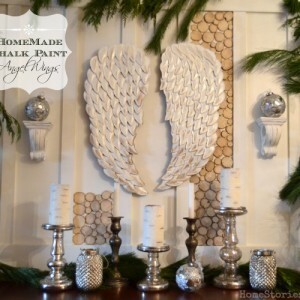 Very pretty mantle, Beth and the wings turned out gorgeous! Beautful mantel, Beth! I liked your tip for the fresh flower selections that last, and those mercury glass lanterns are a hit with me as well. I don’t comment often enough but I had to tell you that I LOVE it. Love. The wood rounds are amazing and I actually like that it is just the middle sections. I think it makes it stand out. Man, if I had seen those angel wings I would have snapped them up. 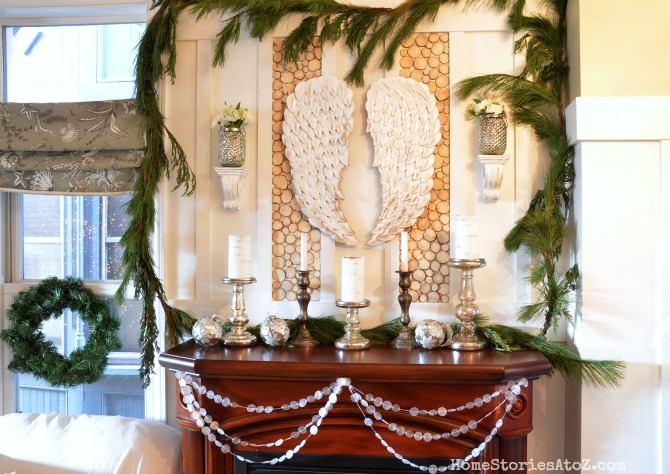 I did DIY wings for my mantel and I spent almost as much as you did. I love it Beth! I’ve been wanting to make one of those faux capiz shell garlands and I just might try it now! I don’t think I would add any more wood rounds to the two outer panels. I think it would look too “stripey” if that makes sense. I love it just the way it is! It sure looks pretty. I love me some sparkly mercury glass and the wings are fabulous!! I especially love the wood wall you made. So creative. It is gorgeous. I love it all. I love the wood circles and think you should leave it like that. I think if you do more, it might make it look too top heavy. Does that make sense? It’s just gorgeous, Beth! I think your wood circles totally make the whole look. I have a similar project planned for the spring…can’t wait! 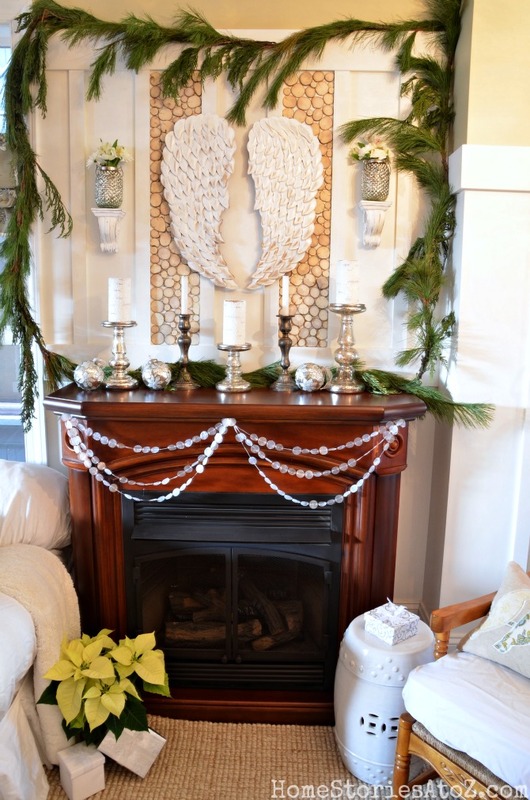 omg I love the simplicity of your mantle and those wood circles! cannot wait to see the finished product. It looks great! I had to comment because I have admired those same mercury lanterns at a local specialty shop and I can’t believe you found them for $3! I think they’re around $29 at my local shop! I love what you did with them. Yes, when I turned them over and saw the clearance pricetag I couldn’t scoop them into my cart fast enough! I don’t know if you have Big Lots near you, but they had mercury ornaments this year. 6 littles ones for 6 dollars a box, and 4 big ones for 6$ a box. They had silver, red and a deep dark purple at my Big Lots. I thought the price was amazing. Your display is really pretty. Thanks for sharing. Great tip Cara! We do have Big Lots and I haven’t been in ours for quite awhile. I’ll have to go peruse sometime soon! 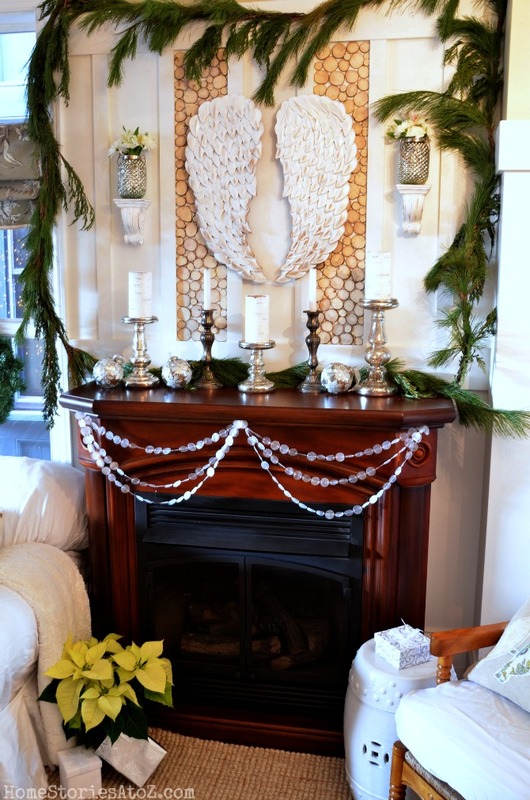 Your mantel is one of the best I’ve seen in blog land this year! The wings and all those little wood circles are my favorite! Beautiful job! Wow Cristina! What high praise! Thanks girl :). Thanks so much Caitlin! It’s relatively easy to create the wall but cutting the wood for this project was scary.